Graduation 2019 is just around the corner. 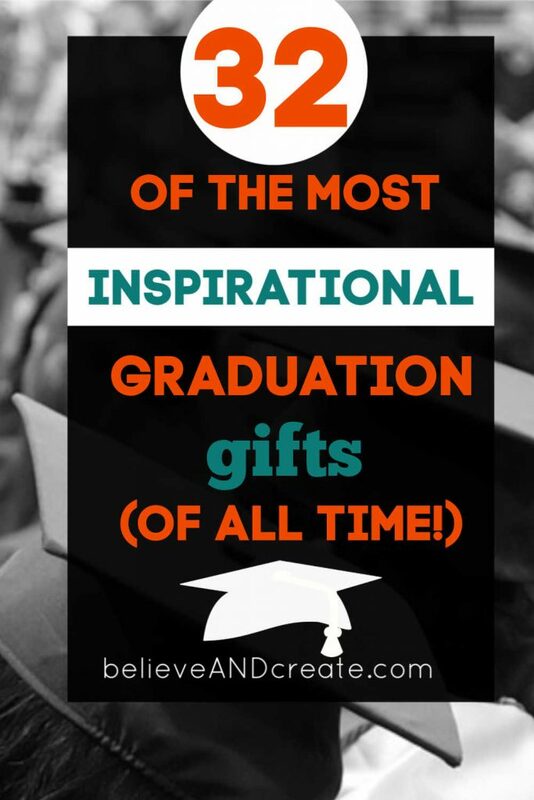 Have you figured out what inspirational graduation gift you’re going to give to your 2019 graduate yet? Graduation time is an extremely emotional time for graduates and their loved ones. It’s a time of accomplishment. It’s a time to celebrate achievement after many years of struggle and hard work. 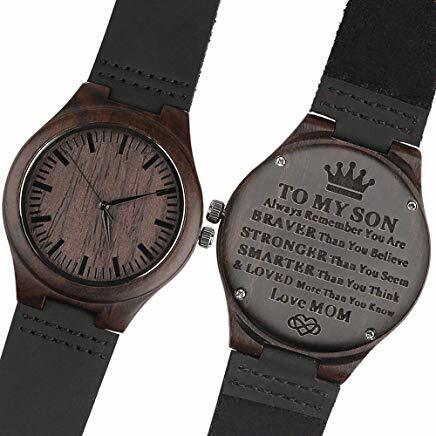 It’s also a very meaningful life event where an average gift simply won’t do; you want to give your loved one an inspirational graduation gift that they’ll treasure for years to come. I love graduations; I always have. They’re full of inspiration and promise for the future. They are the beginning of new chapters where anything is possible. 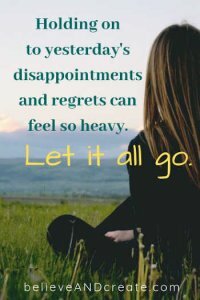 Graduates rarely understand the full implications of what’s ahead, but those of us who have been through this life transition understand just how precious our graduations really were. Graduations are also the time to express how proud your are of your graduates … how much you love them … how much they mean to you. Ordinary gifts just don’t cut it. 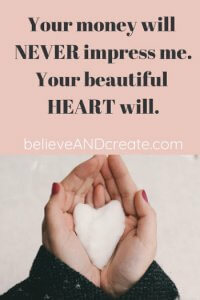 So, we’ve gathered a collection of gift ideas (affiliate links provided) that will send the deep inspirational message that you want to send. 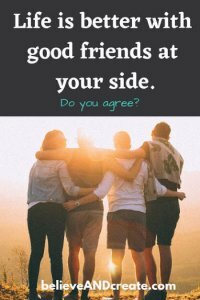 Yes, the same author who inspired graduates before they ever set foot into a classroom has some sage wisdom to share as they move into the next chapter of their lives. 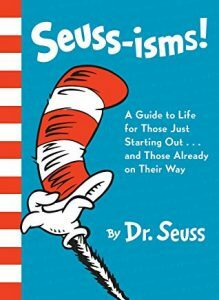 Dr. Seuss offers some of his most memorable quotes and wisdom in this humorous and inspiring book. 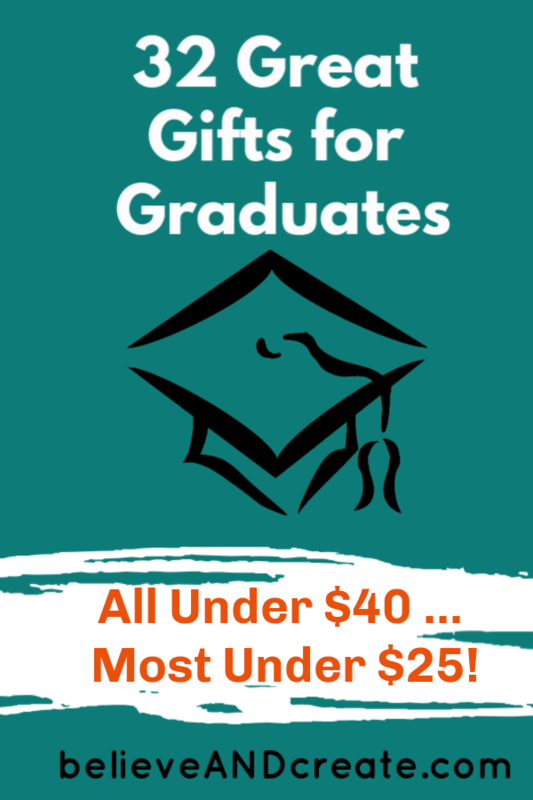 It’s a great gift for your graduate! One of the most important messages you can offer to a recent high school or college graduate (or even middle school graduate) is that their future is bright, and they are limitless. 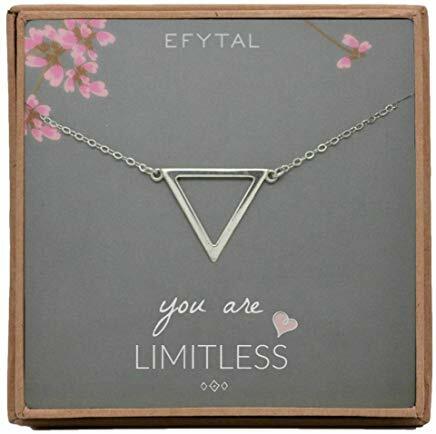 This triangle necklace from Efytal reminds your graduate that she should believe in herself, because when she does, she’ll be unstoppable! Nothing says happy graduation quite like a nice pen (because your graduate’s probably been using disposable pens for years!). 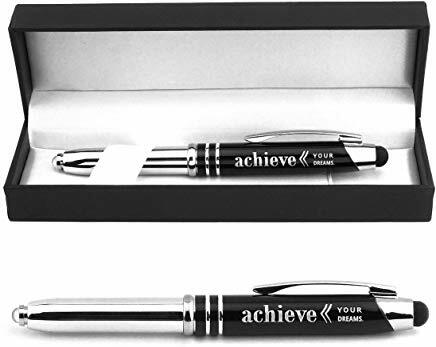 This pen offers an encouraging message for your graduate: Achieve your dreams. It’s a classic grad gift that your graduate will use for years. 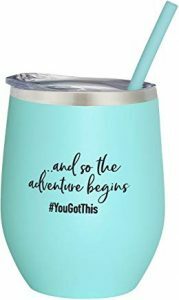 This set makes a great gift for one graduate or can be handed out individually to inspire everyone at the graduation party. Inspirational sayings include “be yourself,” “change the world,” “the best way to predict the future is to create it” and more. This simple necklace reads: Behind you, all your memories. Before you, all your dreams. Around you, all who love you. Within you, all you need. 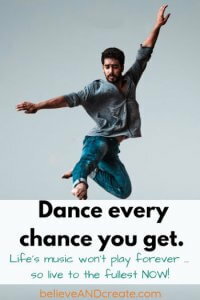 It simply doesn’t get more inspirational than that! 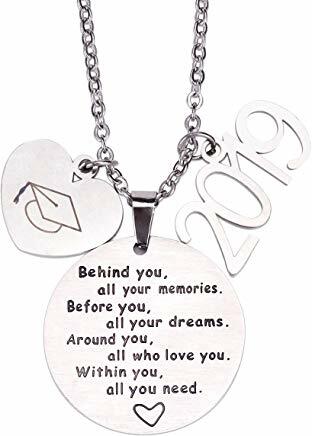 This sweet necklace is available on Amazon right now for only $10.99 (price subject to change – so hurry if you want to grab this for your grad!). You might think that a pillow would be an odd graduation present, but I firmly believe that you can give an inspiring gift that’s practical, too. If your graduate will be going to college soon or setting up a new apartment soon, then they’ll need pillows. 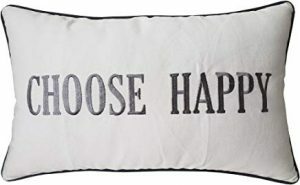 Why not give them a pillow that will remind them that life is to meant to be happy, and that happiness is always their choice! 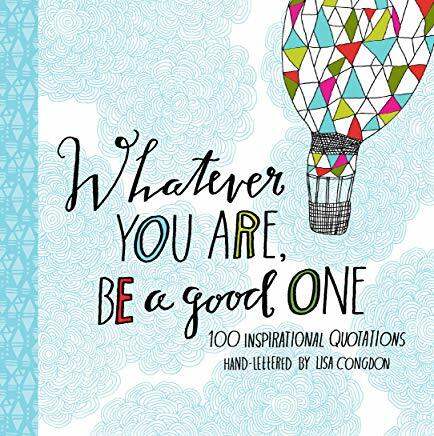 This thought-provoking collection of quotes beautifully illustrated by Lisa Congdon is sure to be a gift your graduate will treasure for years to come. I simply can’t think of a more fitting metaphor gift for a graduate than a working compass … a symbol to help them find their way. 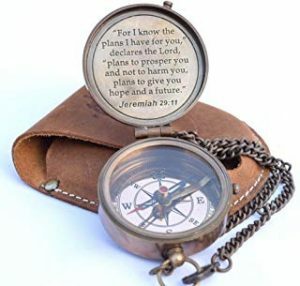 This compass is engraved with Jeremiah 29 11, which makes it all the more fitting for the Christian graduate. 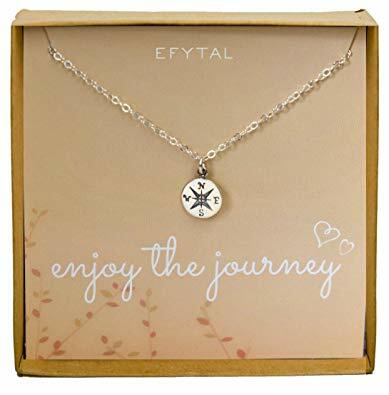 This delicate necklace is a subtle reminder to your graduate to enjoy the journey. She’ll think of you every time she wears it. This gorgeous journal gift set comes with a 7 x 5 notebook, plus an antique-style pen and box. Write a personal note to your graduates to encourage them to enjoy what’s next in their lives and to believe in themselves, just like you believe in them. 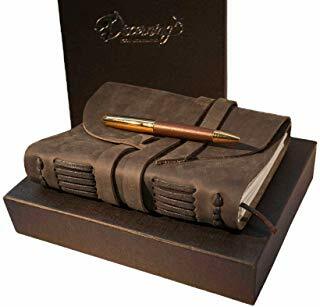 Encourage your graduates to use this journal to keep a record of their many thoughts and experiences as they enter this new stage of their life. This small keepsake/jewelry box that plays Pomp and Circumstance is sure to touch your graduate’s heart and remind her of her graduation day for years to come (and she’ll also remember that you were there for her and gave her this treasure box). 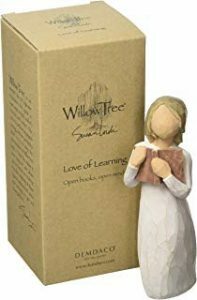 Remind your graduate that you’re proud of him or her for learning, and encourage them to keep learning their whole life long with this charming hand-painted sculpture from Willow Tree. It’s a gift that your graduate will treasure throughout their life. Graduations are a time when we send our children out into the world; they’re now grown up, but to us they’ll always be our little ones and we’ll always want them to remember they still have a home with us. 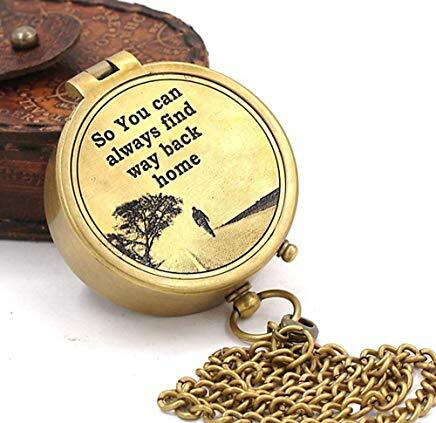 This compass will help you remind your graduate that while you want them to go out and enjoy their life, you’ll always welcome them home again, too. 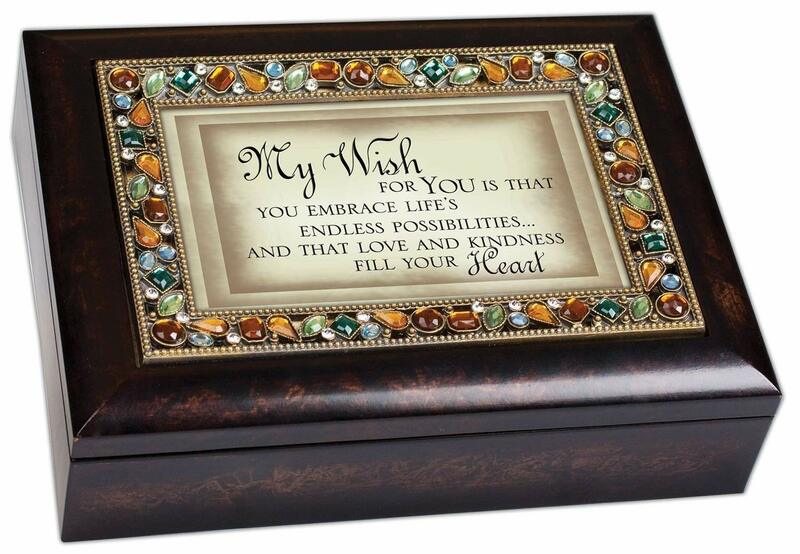 The box reads: My wish for you is that you embrace life’s possibilities … and that love and kindness fill your heart. Imagine this box on your daughter’s dresser for decades to come, because she’s sure to cherish this deeply inspiring graduation gift. Young women need to be reminded to believe in themselves as much as possible. 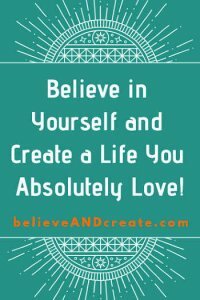 (It’s one of the reasons Believe and Create is such a popular website; confidence issues are rampant, especially among women). 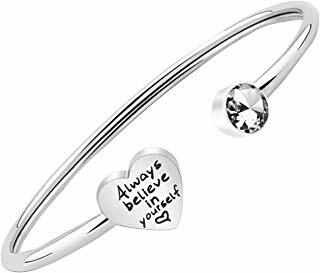 When you give your graduate this sweet bangle bracelet, you’re telling her that you believe in her and that she should believe in herself, too. It’s a message that will resonate with her forever! Watches have been given for graduation gifts since graduations first existed. Unfortunately, most watches are too pricey for the gift buyer who needs to stick to a strict budget. Not this watch! It’s only $32.90 on Amazon right now. 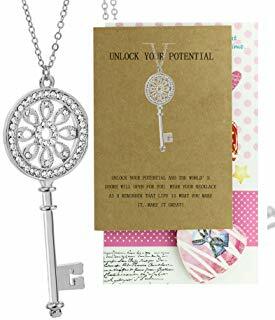 This sweet key necklace reminds your graduate that it’s up to her to unlock her potential. 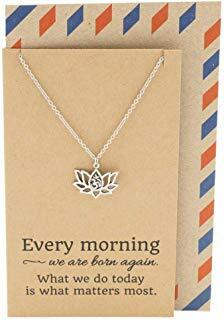 As she wears the necklace each day, she’ll remember that it’s up to her to create a great life for herself. 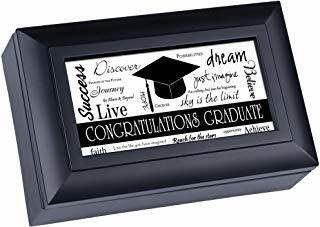 It’s a beautiful gift with a beautiful sentiment for your high school or college graduate. You feel so much love for your son and you want to offer him words of wisdom that he can carry with him for the rest of his life. 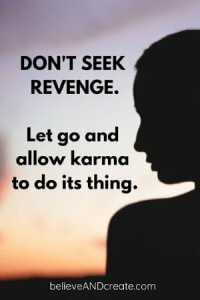 That’s not easy to do. 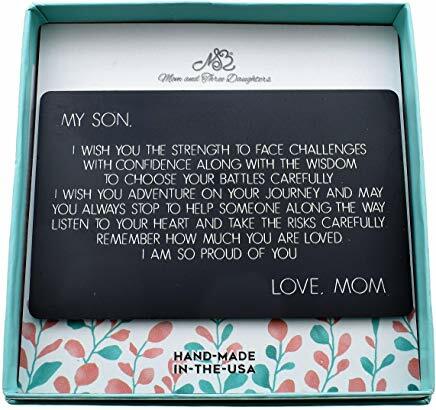 That’s why I love this wallet card gift; it’s a letter of encouragement and love to your son that he can keep in his wallet at all times. It tells your son you’re proud of him and that you love him and that you wish him joy along his life journey. Every time he touches it he’ll feel his mother’s love. 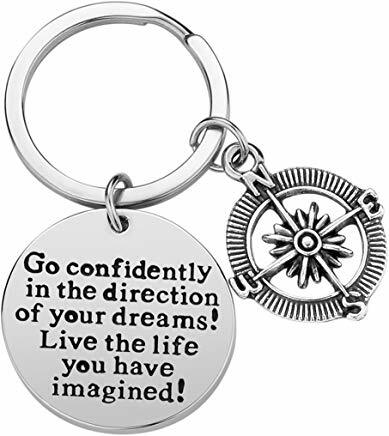 21 Inspirational Key Chain Gift – Go Confidently in the Direction of Your Dreams. Live the Life You Have Imagined! This budget-friendly key chain makes a wonderful gift for those who want to offer a token of congratulations to their graduate as well as some encouraging life advice. 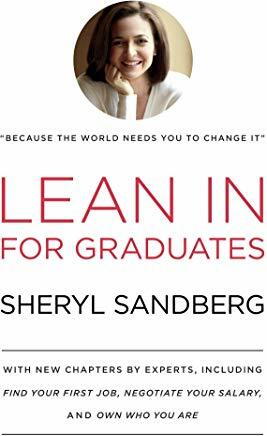 Sheryl Sandberg’s groundbreaking book advised women to “lean in” and grab the life they’re meant to live. Now, Sheryl has introduced a book especially for graduates that offers exceptional wisdom for how to go after and get the life they’re dreaming about. 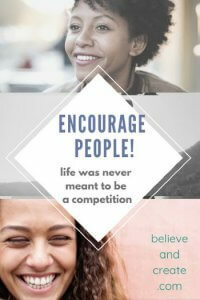 It’s the perfect blend of wisdom and inspiration, which is why this book is a great gift for graduates. 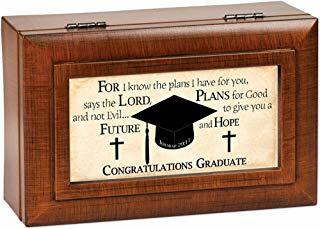 This music box for Graduates offers an inspirational Christian message offering hope and assurance that God is watching over them and has great plans for their future. 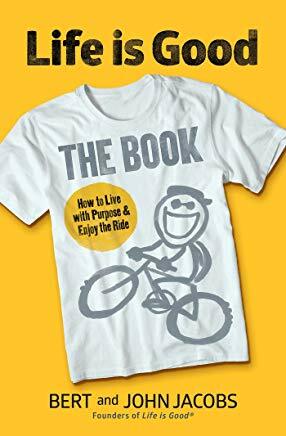 You’ve seen the t-shirts, now it’s time to read the book. This light-hearted book tugs at the heart strings while demonstrating why life is truly good. 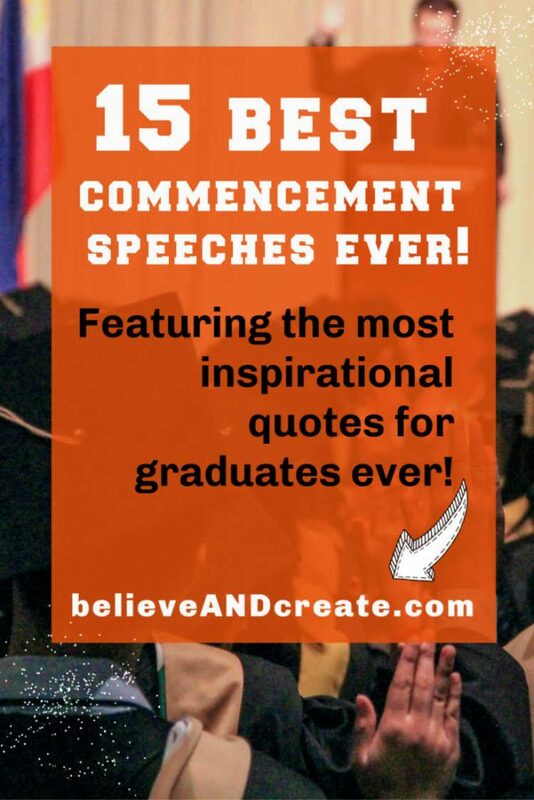 It’s humorous and delightful messages offer wonderful advice for graduates and reminds them that life is good, they just have to look to find the good around them everywhere! 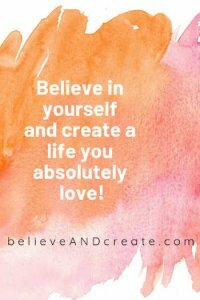 Our website, Believe and Create, stands for “believe in yourself, believe in your dreams, and create a life you absolutely love.” So it’s no surprise that we think encouraging graduates to believe in themselves is very, very, very important. 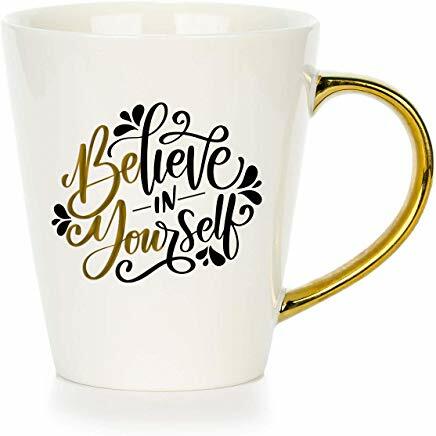 That’s why we believe this inspirational mug makes such a great gift; it reminds graduates to always believe in themselves! 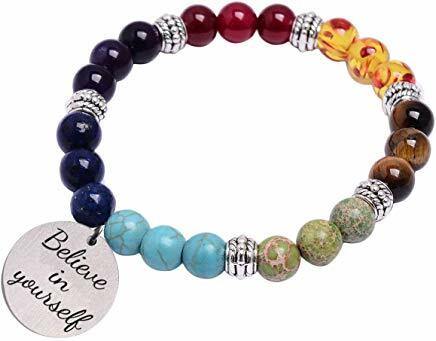 This colorful natural stone bracelet in the 7-Chakra colors reminds its wearer to “believe in yourself.” So, yes, we’re a fan. It’s a beautiful bracelet that your graduate will love. Plus, she will always think of you when she wears it as well as the encouragement and support you gave to her on her graduation day. 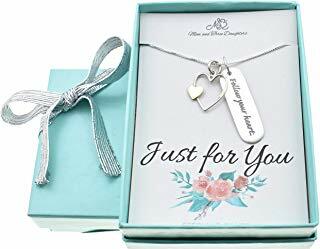 What better advice could you give the graduate in your life than the message to, “follow your heart.” That makes this necklace the perfect gift for your daughter, niece, granddaughter, or good friend. 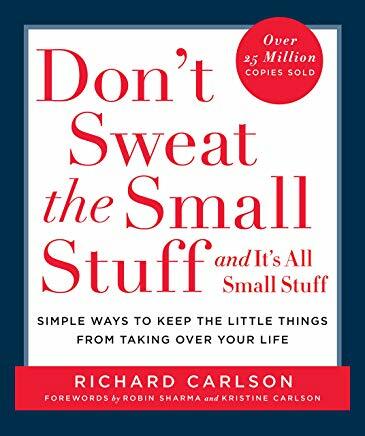 Richard Carlson’s classic book reminds graduates that life may present obstacles and challenges, but it’s really up to them to decide whether they’ll spend their lives all stressed out or live in peace and joy. After all, in the end, most of the things that threaten to rob us of joy and peace are actually quite small and they’re simply not worth getting all worked up about. 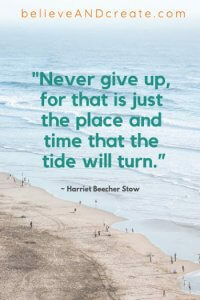 It’s an important message for all graduates as they enter the next phase of their lives. Not all graduates are mature enough yet to understand the importance of maintaining a positive mindset, which is why they need gentle reminders. 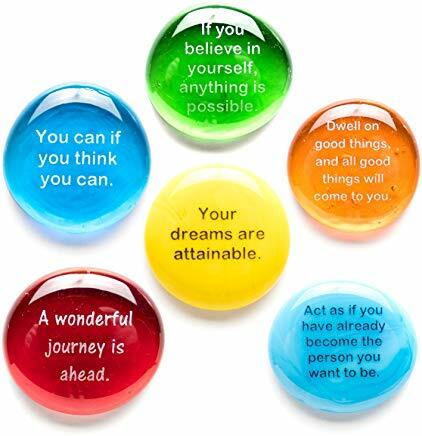 This set of glass stones offers the motivational messages that, when taken to heart, lead to a pretty great life. That’s why this stone set makes our list for great inspirational gifts for graduates. 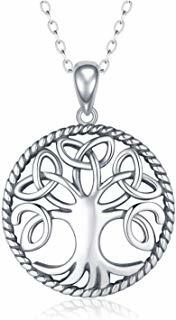 I love this necklace, both because of its link to Celtic traditions, and also because the tree of life is such a powerful symbol for living your life fully. Your graduate will fall head-over-heels in love with this beautiful graduation gift. Your graduate is entering a whole new life in a whole new world. Remind them that they they have the chance … no … the responsibility to be the change they wish to see in the world. 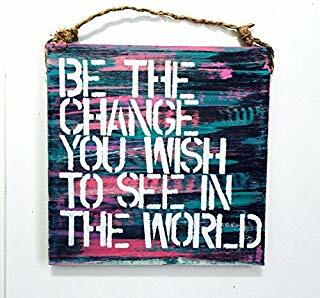 This colorful wooden plaque is a great way to deliver this vital message to the graduate in your life. 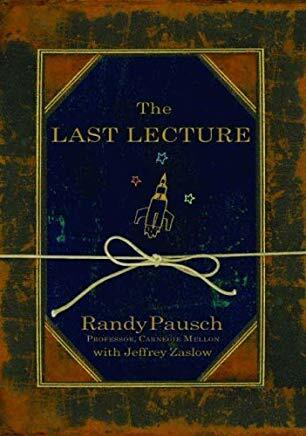 Last but certainly not least on my list of inspirational graduation gifts for the grads in your life is Randy Pausch’s, The Last Lecture. I personally have been giving this book to the graduates in my life for years. Randy, who is literally giving the last lecture of his life (as he’s been diagnosed with a terminal disease), gives one of the most profound speeches on the meaning of life that I’ve ever witnessed. This book is the follow-up to his famous lecture. Now, you maybe thinking that a “lecture” coming from a dying man might be a little too dark for a graduation gift. Nothing could be farther from the truth. From moment one, Randy declares he will keep the focus of the lecture on positive messages that have elevated his life. The graduates in your life may not have any more formal lectures in front of them, but they need to read this super-short book that offers one more lecture, namely, the lessons that none of their teachers ever delivered in school. This is the most inspirational gift I’ve found to give graduates in my life, so I highly recommend it as one of the best, most motivational, most inspirational graduation gifts of all time.